Red and white are the national colours of Canada. 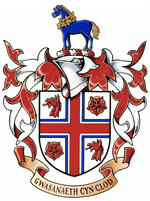 The shield is a metaphor for Mr. Powell’s comment, “Welsh by extraction, English by birth, Canadian by choice”. The red dragon is the traditional symbol of Wales, and the rose is associated with England. Additionally, the red cross of St. George has traditionally been associated with Anglicanism, the denomination of which Mr. Powell is an active member as a Eucharistic Minister. Blue and gold are colours favoured by Mr. Powell. The horse is a symbol of his love of these animals and his pastime as an accomplished rider. His service to Canada and Canadians in many parts of the country in the hospitality industry, as a community volunteer, in tourism associations and in social service projects is represented by the maple leaves. Meaning “Service before self”, this is the motto of Mr. Powell’s former college, and a vital statement of personal belief translated into Welsh to honour his wife’s Welsh roots. Some of the main symbols and ideas from the arms are combined to create a mythic creature linking the grace of the horse and the power of the dragon. 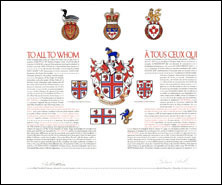 The announcement of the Letters Patent was made on March 4, 2006, in Volume 140, page 431 of the Canada Gazette.